“Shall I cheer you up? No, I’m going to sing another sad one” says Dyble between numbers before delivering yet another impeccably turned-out tune tinged with a bittersweet refrain. In truth these are not sad per se but rather bear witness to her intimate, ongoing connection with the passage of the seasons. Her cut-glass diction and delicate voice gives emphasis and clarity to lyrics that elegantly describe nature's mutability and portents therein. Though still best-known for her work with Fairport Convention and Trader Horne, both of which are represented by charming versions of If I Had A Ribbon Bow and Jenny Mayrespectively, the more ruminative material drawn from Talking With Strangers (2009) andFlow And Change (2013) represents her most cohesive and striking works to date. The romantic lilt of Dreamtime, and it’s darker counterpoint Silence perfectly capture the shift from carefree summer to autumnal concerns without cliche or cloying melodrama. These songs simply say it as Dyble sees it. The success of this live set comes in no small measure from her regular collaborator Alistair Murphy, leading a band whose meticulously detailed support pierces the incipient melancholia with sudden, sunny shafts of baroque-ish pop to ravishing effect. There is gold buried here. Do you want to hear a record featuring a gorgeous female English voice accompanied by guitar, piano and violin, and featuring mature, beautiful songs dealing with the experience of human life? Do you want to hear songs that cause you to reflect on your own life and experiences? Judy Dyble has an incredible story to tell. There she is, singing magnificently on the first eponymous Fairport Convention LP in 1968. She then left and formed Trader Horne with Jackie McAuley. She worked and recorded with the nascent King Crimson, and then again with Lol Coxhill and the Incredible String Band and other notable musicians of the era. Her records were frequently played on the wonderful John Peel show on Radio One. Then, in 1973 she disappeared from the public view, and her life became her husband, family, and a career as a librarian. For most people that would be it as far as fame was concerned. But not Judy. A wonderful change in her trajectory occurred. An event so unlikely as to be incredible. For most of her adult life she lived as a family member and librarian in a quiet fashion. Then sadly she had to endure the premature death of her husband, Simon. When her children grew up, and in an amazing turn of events she decided to return to performing again. These events have led to a rekindled life as a musician, and ultimately to this wonderful record “Live at MM Jazz”. During her years out of the public attention she observed life and experiences, and these are now portrayed in her lovely songs.Starting to record again after all those years has given Judy a wealth of material to use as the subject matter of her songs. Listening to her songs and reading the words shows an artist with great depth, maturity and observational skills. Judy uses her life experiences and observations to weave songs of exquisite beauty and perception. Her words are her own, but the music is written and performed by her collaborators, particularly the accomplished and talented Alistair Murphy. In the past 10 years Judy has recorded songs dealing with the passage of time, the loss of people and opportunities, the appreciation of the beauty in the world, and commentaries on the human condition. These songs could only be written by someone with a lifetime of experiences to draw upon, and reward the listener with an enhanced image of life to competent the gorgeous music. Judy’s voice is fragile and beautiful, and quintessentially English in it’s expression. Her musician collaborators are experts at conveying mood. After a number of excellent studio records, each one being a landmark of that year’s releases, she has released this magnificent live CD that actually transends the original source records. WM Jazz is situated at the Millenium Dome, and this concert occurred in December 2013. “Live at WM Jazz” could be taken as an excellent summary of Judy’s work to date, but it is much more than that, as it is really the pinnacle of her music so far.The accompanists play various guitars, piano, keyboards violins and flute, and manage to produce sounds of classical music, folk, ambient, chamber music and psychedelia at turns. The sound is at once ultra-modern and ancient as days. Older days are remembered by her performance of Fairport’s first single “If I Had a Ribbon Bow”, and Trader Horne’s “Jenny May”, and she does such a great job at reinterpreting these that I hope she revisits other landmarks from her recorded past . Looking back at her early recordings I can see a lot of songs I would love to hear her review and record again. But it is her recent songs where she really shines. “Talking with Strangers” starts off the record and is instantly memorable and noteworthy. “Black Dog Dreams” is an amazing accurate observation of depression. But it is when the group turn to performing “Dreamtime” that the excitement really starts. This is the best version of this already lovely song, and is one I keep returning to – it is bouncy and dynamic, and I feel a need to keep playing it each time it ends. The CD is finished off with the magnificent “Sisterhood of Ruralists”, a wonderful evocation of the art and imagery of four artist and the paintings they create. Judy’s music is unique both in its concept and its delivery, and this CD is a fine example of it. “Live at WM Jazz” is on my list for one of the best releases of 2014 – a year that has already produced some magical music! “Concert recording” and Judy Dyble: for many years these words couldn’t share a context. Since the late ’60s, the singer’s on-stage appearances have been sporadic and usually hosted by FAIRPORT CONVENTION, the band she once fronted. Judy playfully revisits that time with their debut single “If I Had A Ribbon Bow” on her first-ever live album which is anything but a trip down the memory lane. Save for another gentle glance over the shoulder with “Jenny May” by TRADER HORNE, a duo Judy didn’t have much of chance to tour with, Dyble’s current set represents her latest brilliant brace of albums, "Talking With Strangers" and "Flow And Change" from 2013, and the former’s title track provides a perfect piano-rippled opener to this silvery suite of songs. CROMERZONE - Singer-songwriter Judy Dyble returned in 2013 with her critically acclaimed album Flow And Change. 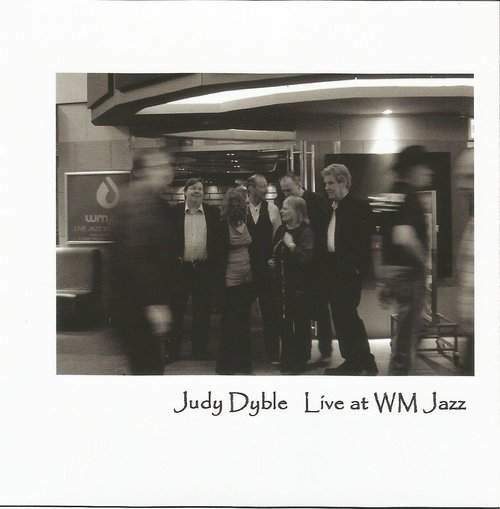 Following the success of that CD, Judy is back in 2014 with a live album recorded in 2013 called Live At WM Jazz. Assisted by a full band including keyboardist Alistair Murphy, guitarist Jeremy Salman and others, the eleven track CD features live versions of music from Flow And Change, while other tracks echo her work as the original lead singer in Fairport Convention and her involvement in the very early King Crimson. The CD booklet reprints the original concert review in Prog magazine while and also features b&w pictures of the concert. For those who haven’t heard Judy’s music, she clearly remains a masterful vocalist and her presence on the 21st century music scene, despite years of being out of the public eye and ear, is a most welcome reminder of just how gifted she really is. While none her early musical cohorts from Crimson and Fairport are present on this live CD, backed by a fantastic group of musicians, on Live At WM Jazz Judy uniquely redefines the essence of progressive music and comes up with a sound that can only be described as 21st century prog-folk. Fans of classic English progressive music, don’t miss this CD.